Odyssey’s Twisted platform pedal has been around for well over 20 years, and while it wasn’t always the most popular pedal option, dare I say it’s as influential to the modern generation as the Shimano DX pedal was to riders in the 80’s. Think about it – plastic pedals, for the longest time, were really only found on complete bikes, and although this was one of the main places you initially saw (and to this day, still see)Twisted PC’s, they started to gain popularity amongst riders sometime within the last 10 years because of their affordability, grindability and slightly reduced shin shredability due to the lack of steel pins. Combine those aspects with a plethora of assorted colors available, and the added perk of being more skatepark friendly and even the most staunch alloy pedal pusher would be hard pressed to disparage their popularity. So with all of these benefits, why release the new Twisted Pro PC pedal in 2017? No matter how iconic a part might be, the longer it’s available to the public, the more likely it’ll eventually need to evolve. Even though the Twisted PC still sells in droves, there are plenty of other pedal options on the market these days, and if I were to guess, the popularity of Tom Dugan’s signature Grandstand PC pedal likely gave Odyssey a few ideas as to how they could improve their old standby. With that, the Twisted Pro is born. Boasting a wider, longer pedal body with a slimmer platform, the Twisted Pro pedal kinda reminds me of a slightly tweaked version original Jim C pedal, which was one of Odyssey’s most popular products throughout the 2000’s. When it comes to pedals, wider is better, as the wider body increases stiffness & pedal feel, theoretically causing less slippage. You’ll still get the same 4130 spindle with unsealed bearings, which seem to be a more reliable option than some of the bearingless pedals out there, and the weight difference is moot, as the extra width is offset by the slimmed down body. 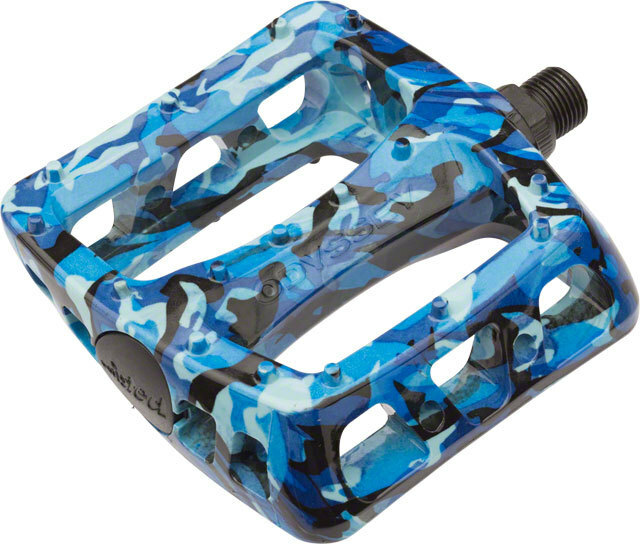 The Odyssey Twisted Pro PC pedals are available now at all Odyssey retailers and mailorders. The new pedal will run you just a few dollars more at $19.99, but if you’re looking for extra stiffness in your PC pedals, those few dollars are well worth it. While the Twisted Pro’s are currently only available in black, stay tuned for more color options later this summer – and if you have to have your arctic camo or crackle pedals RIGHT NOW, don’t stress because the original Twisted PC’s aren’t going anywhere. To view the entire Odyssey catalog and stay up to day with team/product info, be sure to browse www.odysseybmx.com, and make sure to follow the brand on Instagram @odysseybmx.